Hydration is just as important for pets as it is for people. The problem is that your cat or dog can't just open the refrigerator to grab a drink when they're thirsty. My cats tend to do instead is find a half-full glass of water somewhere in the house to drink from before spilling the remains all over the floor. The Drinkwell Two-Gallon Pet Fountain ($65) solves that problem. Most pet parents are content to provide their pet with a bowl of fresh water that they refill on a daily basis or as needed. The problem with this is that the water can go stagnant or get dusty, and if it doesn't taste fresh, your pet will be less likely to drink it. Studies actually show that animals prefer to drink from running sources of water - and a pet fountain may be the best way to accommodate that preference. The concept of a pet fountain was a little strange to me when I first heard of it. It seemed like the kind of novelty gift you might buy for someone if all you knew about them was that they had a cat. After doing a little more research of my own, however, I came to understand that pet fountains are actually pretty great and that led me to testing one for myself. Pet fountains come in many forms, some with free-falling streams and some without. Most pet fountains contain a submersible pump that keeps the water circulating with a replaceable filter to remove impurities. When choosing a pet fountain, you should consider the size of the bowl and the refill tank as well as other factors such as how easy it is to clean. I've been testing out the Drinkwell Two Gallon Pet Fountain for my cats, and I've found it to be a great choice for multi-pet households. The $65 Drinkwell Two-Gallon Pet Fountain features a simple but functional design. It consists of a large plastic bowl with a two-gallon capacity and a tower at the back that houses the motor and other parts. According to the PetSafe website, the Drinkwell Two Gallon Pet Fountain is designed for convenience and easy cleaning. The features they highlight are the easy-to-fill bowl and the rounded-corner design which eliminates hard-to-reach crevices that could be difficult to clean. The Drinkwell Two-Gallon Pet Fountain is not the first pet fountain I've tried. In fact, I'd been using another Drinkwell model for the better part of the last year prior to receiving the two-gallon version. While writing a roundup of the best cat fountains, I read the reviews for some of the most popular models on the market. Though there were a few exceptions, most of the pet fountains that stood up to the test of customer reviews were all from the same brand. The PetSafe Drinkwell 360 fountain earned my top pick for the best multi-pet fountain while the Drinkwell Pagoda fountain was named the best ceramic fountain. The model that earned my top overall pick was the PetSafe Drinkwell Platinum pet fountain, and that's the model I eventually ended up purchasing for my own cats. For the most part, my experience with the Drinkwell Platinum was positive. My cats got used to it fairly quickly, and the size was perfect for the space I had available. I liked that it had a plastic reservoir tank that made it easy to refill the fountain as well as the adjustable flow. After I got my puppy, Archie, however, the refill tank didn't last as long, and once the tank got below a certain level, the motor would start making an awful grinding noise. Compared to the Drinkwell Platinum, the Drinkwell Two-Gallon Pet Fountain is much larger and deeper. The assembly was a little tricky in comparison, and there is no refill reservoir. 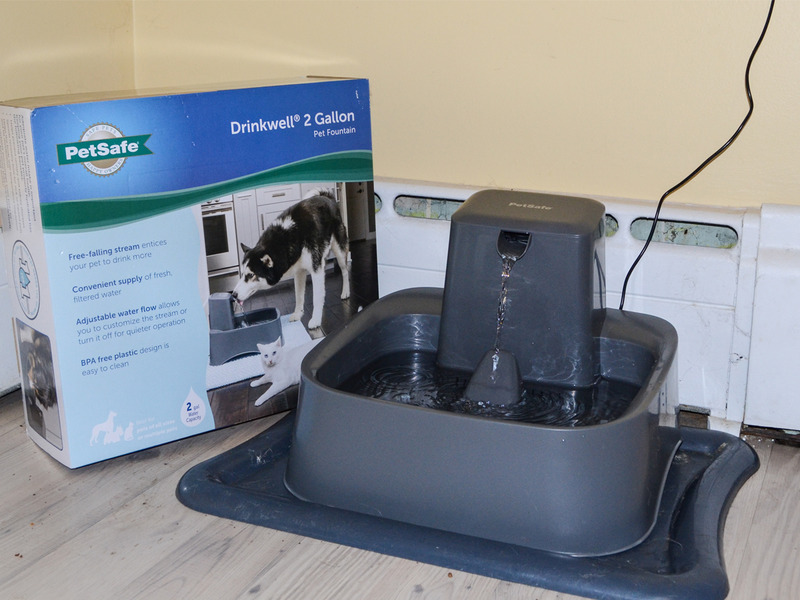 The Drinkwell Two-Gallon Pet Fountain is marketed as a good option for multi-pet households. I would agree that the depth and size of the bowl is much better for a dog than the Drinkwell Platinum, though I can see some cats not liking it. My cats are fairly small, but they can still drink from the fountain with no issues. I also imagine that the size of the fountain makes it more comfortable to drink from for a dog. How bad is the noise? Both the Drinkwell Platinum and the Drinkwell Two Gallon Pet Fountain feature an adjustable free-falling stream to keep the water fresh. Inside the bowl below the spout, both models have a mound that helps prevent splashing and should, ideally, reduce the noise as well. This feature worked very well on the Drinkwell Platinum, but there is still a constant noise of falling water from the Two-Gallon fountain. Both Drinkwell fountains are adjustable, and you can turn the stream off entirely for more quiet operation, I just wish I didn't have to turn the fountain off completely to eliminate the noise. As a stand-alone product, the Drinkwell Two Gallon Pet Fountain is great. I love the generous two-gallon capacity and the fact that it is easy to clean and refill. In comparison to other pet fountains, however, there are some minor things about the Drinkwell Two Gallon Pet Fountain that I don't like. Though the fountain came with picture-based instructions for assembly, it was still a little confusing. I also dislike the noise it makes, but my cats won't drink from it if the water isn't running, so it's something I'm trying to get used to. Large two-gallon capacity with a deep, square bowl. 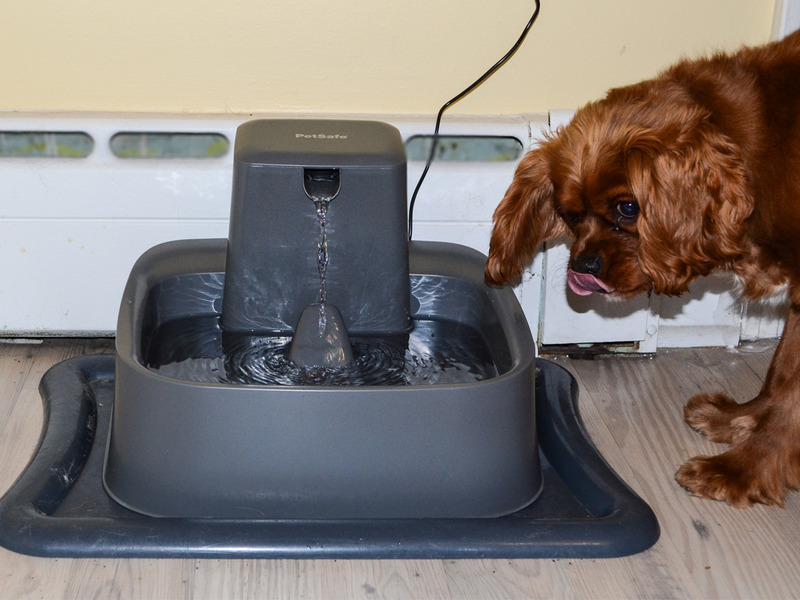 Free-falling water stream entices pets to drink and keeps water fresh. Comes with a one-month supply of foam and carbon filters. Made from BPA-free plastic with dishwasher-safe parts for easy cleaning. No automatic refill reservoir, you must refill the bowl directly. The free-falling stream is fairly noisy, though you can adjust the flow. You may need to replace the filters more often with multiple pets. Overall, I can confidently say that I have become a supporter of pet fountains and the Drinkwell Two Gallon Pet Fountain is an excellent option for cats, dogs, and multi-pet households.